Welcome to the online editions of all the Harper's Weekly newspapers published during the Civil War. These old newspapers are a treasure trove of illustrations and news reports created by eye-witnesses to the actual events and battles. You are viewing a leaf from an original 1862 Harper's Weekly newspaper. 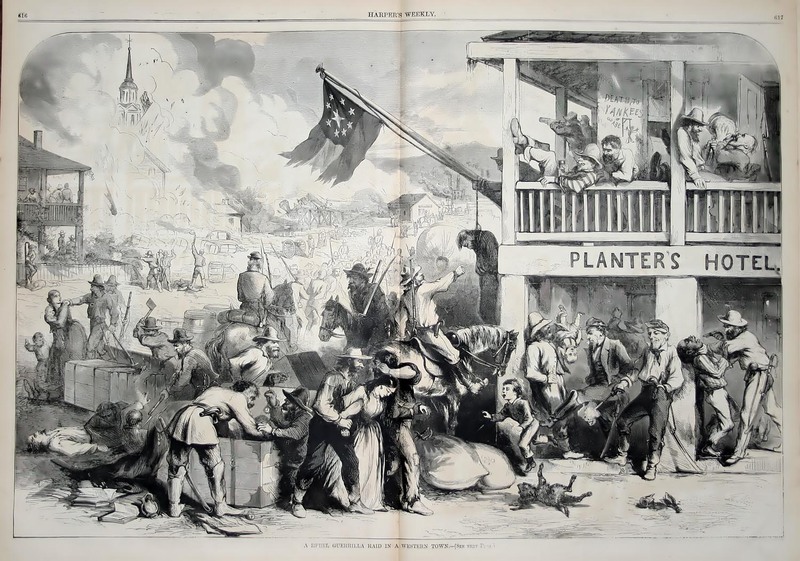 The leaf features a stunning illustration of the famous Quantrill Raiders sacking a western town. The illustration is by Thomas Nast, one of the most famous artists of the 1800's. This stunning illustration captures the confusion and panic in a town hit by one of Quantrill's lightning fast raids. The image captures all the deprivations and atrocities attributed to this group of Guerrilla Fighters. Many of Quantrill's men went on to become notorious western outlaws after the war, including Frank and Jesse James, the James Gang, and the Younger Gang. The illustration is described on page 618.